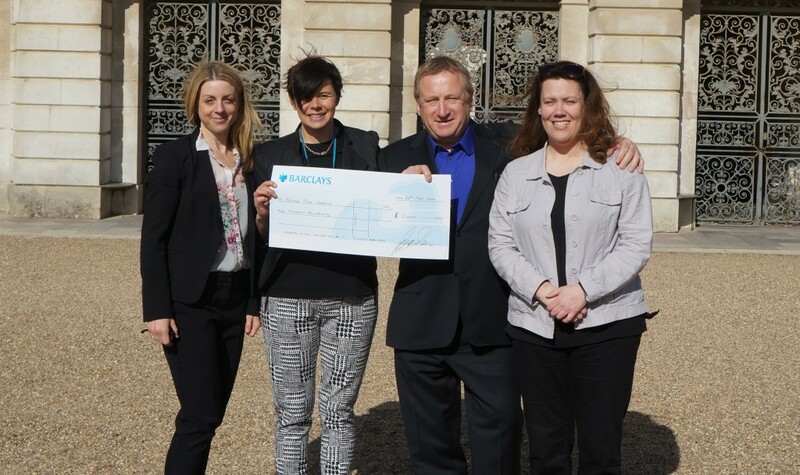 George Irvin’s Funfair recently presented a cheque for £2,000 to us at Hampton Court Palace. The funds were raised, in part, from the sale of wristbands on ‘Charity Tuesday’ at this year’s Hampton Court Fair. Unfortunately, bad weather over the Easter weekend meant that the footfall at the Fair was lower than usual and fewer than anticipated wristbands were sold. However, George Irvin generously decided to top up the proceeds from the wristband sales with an additional donation, to ensure that we still received the £2,000 that he had pledged. George had been inspired to support the Hospice after talking to Clinical Nurse Specialist, Nina Kale, who cares for Hospice patients in the comfort of their own homes. Mia Patterson from our Fundraising Team said: “Everyone at the Hospice wants to say a huge ‘Thank-you’ to George and his team for their fundraising. The funfair will be raising money again for us at next year’s Hampton Court Fair on the 14th to 18th April 2017; when it is hoped that the weather will be kinder. For further information on fundraising for Hampton Court Palace please contact the Fundraising Team on 01372 461808 or email supportercare@pah.org.uk .